Does what we eat really affect the health and appearance of our skin? Can we eat our way to healthy skin? When we think about treating a skin problem, often our first thought is which products we can reach for. It’s easy to be taken in by adverts and reviews of beauty products that promise to fix all of our skin woes. But, sometimes, we overlook the simplest and easiest fix of all. Food. What we eat is a huge contributor to the overall health of our skin. 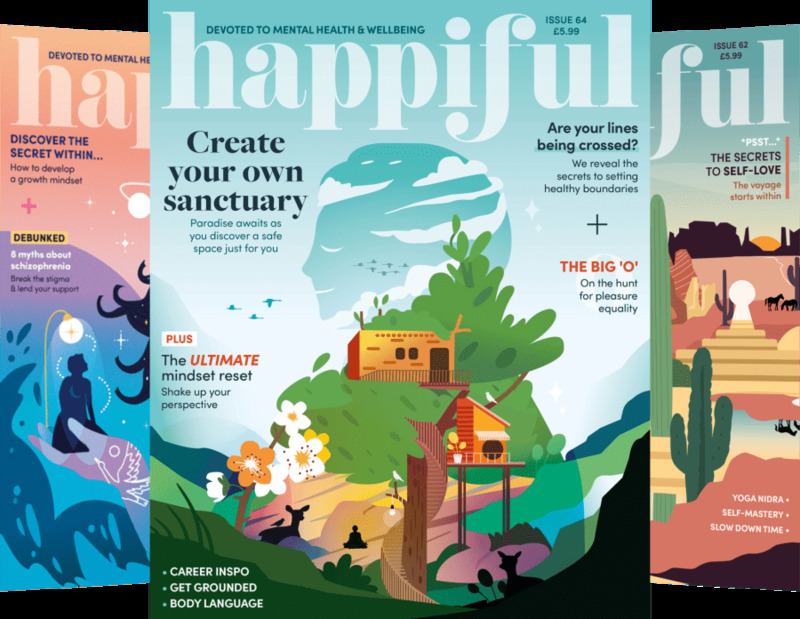 So, in this week’s blog, we’re exploring the best foods for maintaining skin health – and there are even a few recipe ideas you can try! How can we nourish our skin from within? Zinc is very important for maintaining healthy skin. The skin contains about 20% of the body’s zinc so, if the skin is lacking in this, acne is often a symptom. Essential fatty acids (EFAs) contribute to the moisture of our skin and also help to repair it. The body can’t produce these so, if you’re suffering from inflamed or dry skin, upping your intake of essential fatty acids may help. Beta-carotene is an antioxidant that converts into vitamin A in the body, helping to grow and repair body tissues. It is thought that beta-carotene can help prevent premature ageing as it helps to reduce environmental damage. Take it right back to basics; take stock of what you’re eating. To ensure you are eating a well-balanced diet containing the best foods for skin health, it is advisable to speak to a nutritionist. You could also consider making a food diary – and, if you do, try to be thorough. Perhaps this will highlight warning signs – you might be consuming more dairy than you thought, or you’ve been lacking in fruit and veg lately. It will all show on your skin. 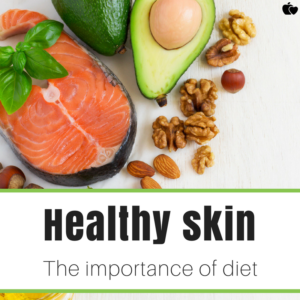 Use this knowledge as power – assess your skin issues and how your diet might be affecting (or causing) these. Breakfast: Avocado on toast with a poached egg. Packed full of B-complex vitamins, beta-carotene and vitamin E, avocados contain the key vitamins for healthy skin. They also contain healthy fats, which helps to hydrate the skin. If you’re having a bigger breakfast, add some smoked salmon, too! Lunch: Carrot batons with hummus. Bulk up your usual salad, by adding this tasty accompaniment. Carrots contain high levels of beta-carotene, helping the body produce skin-saving vitamin A. So, dunk them into this avocado hummus and you’re onto a winner! Dinner: Baked salmon with leafy greens. If you suffer from dry skin, salmon should become a regular feature in your diet. Rich in EFAs, salmon helps to restore moisture from the inside out. Try this recipe from Hello Fresh and you’ll even get a portion of kale in, too! Kale is well-loved in the health food world for a reason; it is rich in vitamins and contains beta-carotene. Snack: A handful of nuts – and add in some berries. Walnuts are a great source of essential fatty acids, and they also contain copper – a mineral that promotes collagen production. So, all in all, they’re great for improving skin’s elasticity. Combine them in a small pot with some berries, (rich in antioxidants and vitamin C) and you’ve got a powerhouse of a snack, ready to go! 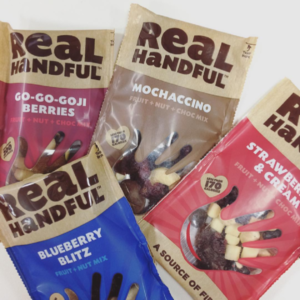 Or (if you don’t have time to pack your own), grab a mixed bag like these ones from Real Handful! Skin is a complex thing, and there won’t necessarily be an easy fix for all skin concerns. Whilst a nutritionist can guide you with what to put into your body to improve your skin’s health, this might not help in all cases. If you are struggling with a skin complaint, we would recommend speaking to your GP or dermatologist as the first port of call.